ArkhamCity.co.uk have compiled a handy list of what pre-order bonuses are available for Batman: Arkham City and more importantly which ones are applicable to the UK territory. 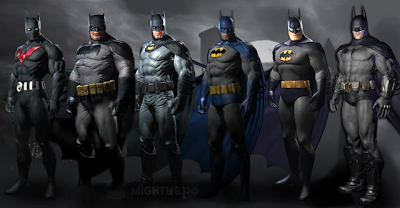 Currently known is that pre-ordering the game from ShopTo.net will bag you the 1970s Batman skin and pre-ordering from GameStop.co.uk will get you the Batman Beyond skin. Additionally those who pre-order the Collector's Edition regardless of retailer will receive the porky elderly... we mean The Dark Knight Returns skin based on Frank Miller's highly-regarded graphic novel.. Currently unconfirmed for the UK are Robin's Red Robin skin, the Animated Series skin and the Earth One Skin. 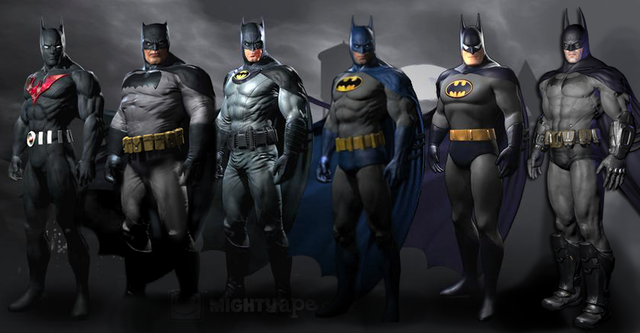 From left to right: Batman Beyond, The Dark Knight Returns, Earth One Batman, 1970s Batman, Animated Series Batman and the original Arkham Asylum Batman.